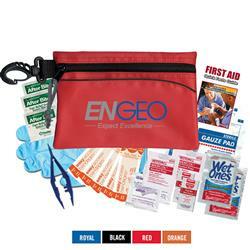 Our portable outdoor first aid kit - perfect for hiking or general use. Includes: 2 Wet Ones Antibacterial Wipes, 2 Antiseptic Swabs, 3 After Bite Itch Erasers, 2 Alcohol Pads, 1 First Aid Quick Card, 1 Tweezer, 2 First Aid Ointments, 1 Pair Nitrile Gloves, 2 - 3"x3" Gauze Pads, 5 Bandage Strips. Remember, this first aid kit is built to order. 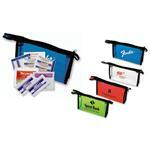 If you need other first aid items inserted, we build a custom kit to your needs! Inquire for your custom first aid kit! Production Times Available: 5 to 10 Working Days. INQUIRE FOR RUSH! Typical Imprint Area(s): 5.5" X 2.25"
Includes: 2 Wet Ones Antibacterial Wipes, 2 Antiseptic Swabs, 3 After Bite Itch Erasers, 2 Alcohol Pads, 1 First Aid Quick Card, 1 Tweezer, 2 First Aid Ointments, 1 Pair Nitrile Gloves, 2 - 3"x3" Gauze Pads, 5 Bandage Strips. Custom fill available - please inquire for pricing.